Currently, we are stove & oven-less* leaving only the grill to cook our meals. So after Matt grilled some salmon & fennel for dinner, we turned some fresh figs into an easy grilled dessert. This is such a simple dish but I think makes for a pretty presentation. Plus its wonderful when you don't want to heat up your kitchen baking a dessert. No real recipe here but here are the steps to make it. 1. Slice ripe figs in half & remove stems. 3. 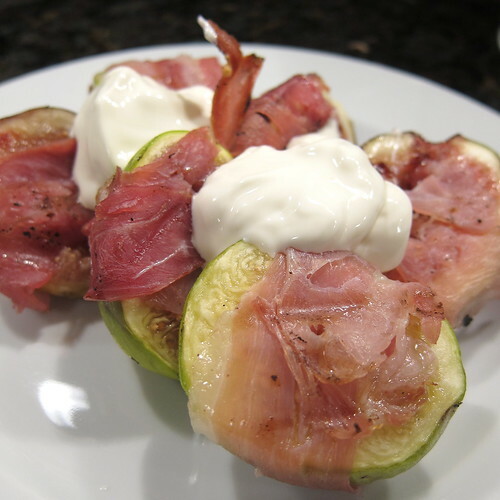 Grill the wrapped figs until they are warm & the prosciutto starts to crisp. 4. Serve the figs while warm with mascarpone cheese. I didn't sweeten the mascarpone this time but, next time I serve it for dessert I will with a little honey (because honey & figs, so yum.). With the unsweetened cheese this dish could also be easily served as an appetizer or cheese course. * Our old stove died almost two weeks ago (Less than 5 year old stove & the cost to fix it isn't worth it, what a waste). We bought a new one & it is sitting in the kitchen but in Minneapolis you have to get a permit & have a licensed installer out for a gas stove. We have one coming this afternoon & I can't wait to get back to normal cooking. I've never tried figs with marscapone cheese. I adore these sweet jammy bundles contrasted with a salty well aged prosciutto, and the marscapone must add a nice rich touch. I admit I have never tried figs, so I am very intrigued and must now go find some. Sat morning will be a Fig Hunt! One of the best meals Paul & I ever shared had a starter of figs stuffed with gorgonzola and mascarpone and wrapped in proscuitto, grilled and then drizzled with balsamic syrup. SO good. This looks fantastic. I wish I had a grill.